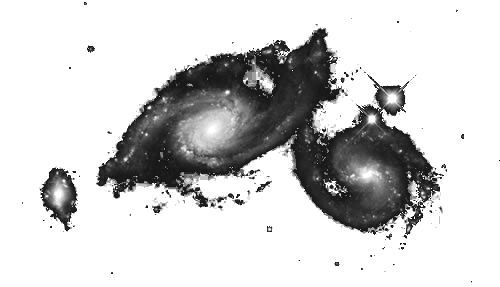 10) Gathering Galaxies | The Big Bang? Some time later, the diverse array of gases and metals blown out by the first generation of stars began to gather together again within the nodes of the dark matter web, and condensed, swirled and spun into a disk until the first of the second generation of suns set fire. Because they contained more heavy elements, these second suns were more stable and lived for longer than the first generation. A scattering of second generation stars are still alive today at the edge of our own Galaxy, in a region known as The Halo. The suns that had formed by this time started to find each other through gravity, and formed clusters and communities that were the first galaxies. It may be that at the centre of each of these gatherings was a black hole, as there are gigantic black holes that can now be found at the centre of almost all galaxies, like an axis point. Different galaxies developed in their own particular way, which resulted in all kinds of shapes and sizes. They are fluid and dynamic entities. They travel around each other, sometimes exchanging gas and dust, sometimes spectacularly colliding and creating new stars and black holes in the process. Large galaxies swallow smaller galaxies, isolated galaxies die off quietly, whereas clusters of medium-sized galaxies will support each other with a mutually beneficial system of trade and exchange. However, it was not until the third generation of Suns were being born that planets, and life, could have a chance to emerge within these systems.